"Par Avion - Sequencer Sketches vol.4" contains 48 minutes of sequencer music plus on the same disc a "bonus album" of "Starfields II" which are about 32 minutes of electronic atmospheres (darker and more electronic sounding than my usual "atmospheric music"). One of the sequencer tracks is a remix of a track that came out with E-dition magazine and is a collaboration with Alpha Wave Movement. 2007. Rudy Adrian Petit dépaysement avec cet album puisqu’il n’est pas fréquent de voir un artiste néo-zélandais défrayer notre rubrique. Et ce nouvel opus est parfait pour découvrir les multiples facettes de Rudy ADRIAN puisque la plaque offre en fait deux albums en un. Les premières 48 minutes comportent les bonnes recettes de l’école de Berlin avec une entrée en matière rêveuse, soutenue par une narration mélancolique en français, suivie d’un Bavarian Eagle tout en séquences schulziennes. Across the Canyons est lui une rencontre entre le boucles de Tangerine Dream et les sonorités spatiales de Vangelis, tandis Soaring Birds aurait pu être écrit par un Gandalf né en terre berlinoise. Sore Birds est l’antithèse du morceau d’ouverture avec ses percussions métalliques et ses sons de guitares distordues. Mais il clôt intelligemment avant la seconde partie, suite des Sequencer Sketches vol.3, qui œuvre plus dans un ambient évocateur de paysages diaphanes. Ici, point de séquenceurs mais un enchaînement d’une demi-heure enfilant de longues sonorités qui vous emmènent pour un voyage dans une autre dimension. Le Kiwi a été à bonne école et ce nouvel album est parfait pour vous initier à sa musique. The music drifts. It's so smooth. Just like the clouds. Having said that certain sections (the second part of "Sore Birds" for example) really burst with energy. The last 2 pieces, lasting 30 minutes, are an album within an album. "Starfields 2" is epic space music. Constantly changing but slowly, almost without noticing. Again, look to the skies! 2010. Bruce Gall / Sunday Synth Here is the last segment of the Sequencer Sketches series, where Rudy Adrian mixes his soft atmospheres with flexible sequential harmonies, on minimalisms and melodious structures. Without being a concept album, the synthesist from New Sealand begins and finishes Par Avion on an old screen of French cinema, with all the pastiches and sound effects we can stick to it, while revealing us his musical ambitions for the near future. It is with the noises of a postman on bicycle, who ride a path brightened by birds’ whistles that Par Avion opens. A woman is reading a letter, whereas the ambiance soaks in a floating pattern where synth modules an air of sadness and melancholy. Gradually, the tempo increases on a fine sequential movement at hypnotic rhythms, like a gliding beat in the middle of gimleting scratches and the chords of a lethargic guitar. A distant wind pushes the first moaning of Bavarian Eagle. Coated of a fluty tint, the movement modulates on a delicate wobbling with harmonious synths and a progressive tempo, which at each rotation’s end increases intensity. Beautiful solos strew this 1st part of Bavarian Eagle, with fine gimlets and a more alive sequence to eroding approaches. An excellent example of a migratory track, that draws its design in the claws of minimalism movements. Softly, rhythm slowed down to undertake a musical migration close to Klaus Schulze’s Crystal Lake. A beautiful piece. Across the Canyons is as poetic as its title. A fine landscapes movement, like Steve Roach, flood of sound effects to metallic crumpling, around a synth to accentuate rotations and driven by the violence of its breaths. A soft harmonious piano drinks by short sips the space, mixing its chords with the guitar ones with the delicate softness of a synth that coats Soaring Bird with an ode to the Eastern spirits, supported by a sequencer to hypnotic movement. A track which possesses cascade rhythms, as the opening track, to completes its course in the serenity of Eolian wind. Sore Birds finishes Par Avion with a shadowy intro to heavy and threatening beats. Hidden by an acid wind and a tempo minimalism, a superb sequence with echotic gimlets remolds the structure, with a very rare aggressively from Rudy Adrian sequences. A great title bordering psychedelic and progressive electronics, with sharp-edged sonorities and distorted guitars, on voracious synth with destructive waves and a heavy sequencer, neurotic with eclectic percussions. The whole thing find his end in the room of our melancholic Frenchwoman, that only the songs of birds manage to collect a sign of life. Starfields II is a slow atmospheric rise that Rudy Adrian intends to explore a little more in his next compositions. A beautiful floating pad with very flexible modulations, that oscillates between the styles of Steve Roach and Michael Stearns. Without sequencer, this slow 30 minutes movement evolves with the likings of the synthetic breaths and landscape sonorities, which modulate in the creative imagination of Rudy Adrian. Par Avion depicts with wonder the union of the quiet atmospheres of Rudy Adrian to his sequencers approaches that have borders. Rudy Adrian embraces all the stages of tenderness and sorrow with the insanity and revolt. A beautiful musical history, where everyone is able to write his own story, his own scenario on these landscapes harmonies. A slightly complex musical world, but not enough to lose any interest at all. 2007. Sylvain Lupari / Canada Rudy Adrian does some nice melodic music with sequencers. He's truly a great talent. 2007. Scott Raymond / USA This release from 2007 offers 79 minutes of melodic atmospheric EM. New Zealander synthesist Adrian is joined by: voice-over on one track by Barbara Stone, while the "Across the Canyons" piece is a collaboration with American synthesist Greg Kyryluk (aka Alpha Wave Movement). Delicate textures establish an aerial vantage for this tuneage, floating high and surrounded by wisps of tonal clouds. Dreamy electronics waft and soar, tickling the ears with fragile notes wrapped in crystalline honey. Chords slide into elongated tones that in turn evolve into pastoral harmonics. At least that's how the songs start off. Once the overall serenity is established, Adrian applies more puissant sentiments to the mix, with ascendant tones and convivial chords that flavor the airborne music with substantial melodies. Elegant riffs are generated with the introduction of stronger electronics. Weight and depth are achieved with cyclic keyboard patterns and shimmering sequencing. Tender piano passages evoke optimistic deliverance. A certain majesty is found in these tunes. Beyond the obvious atmospheric intention, this grandeur is fueled by periodic use of denser tones--nothing dark, more like the regal spectacle of amassed thunderheads minus their stormy content. No percussion is present. Tempos would only get in the way of the music's expansive character. At times, rhythms are approximated through the use of choppy notes. The compositions are rigidly ambient with inclinations for contemporary EM of an ethereal nature. Soothing harmonics are pleasantly seasoned with capable melodies. The music points upward, describing a soaring freedom, liberating the listener of gravity and other earthly concerns. With the last two tracks, Adrian escalates the airborne demeanor of the music, turning the sonic regard toward regions beyond the stratosphere to examine the star-filled heavens. These pieces exhibit spacier properties with the presence of moodier tones and cosmic embellishments, plunging the listener through nebulous vapors and vistas of sparse delineation. 2007. Matt Howarth / Sonic Curiosity Par Avion is the latest release from New Zealand musician Rudy Adrian. This is my first introduction to his music which is predicated on exploring the tones and textures of synthesizer and other instruments. From the title I expected some kind of Berlin School workout, and so was surprised to discover an atmospheric album where the sequencing is restrained and fits well sonically with the rest of the music. Essentially this CD contains two albums. The first five tracks derive from recordings made for a live performance, and the remaining two tracks are the promised atmospheric half of Starfields: Sequencer Sketches 3. The title track "Par Avion" opens up the album with the sound of human activity and birdsong. A woman's voice speaking in French then comes in while golden notes and pads morph into a pleasant rhythmic section. There's a slight Tangerine Dream feel to "Across the Canyons" where a mid-tempo sequence consorts with bold metallic washes and unobtrusive ones leaving a sheen across the backdrop. Air and flight is the focus of the first part of this album. Many of the sounds convey this sense of freedom of the moving through the sky, though not all the sequencing matches that evocativeness and can at times be a little pedestrian. What's especially notable is how the use of melody is subdued and inherent in the sonic exploration. Taking us from the skies of Earth to outer space is "Starfields 2 – part 1". A kaleidoscope of multi-textured slowly quivering washes and drones glide across the soundscape as though we're drifting through a starfield viewing celestial wonders. Briefly deeper and almost churchly chords juxtapose with beaming washes of different hues like seeing starlight at varying frequencies. Now I'm acquainted with Par Avion I'm going to seek out more of Rudy Adrian's work because he's clearly a musician with a lot of talent. It's some of the most pleasing and atmospheric mind music I've heard which incorporates sequencing. 2007. Dene Bebbington / USA The major themes running through the work of Rudy Adrian are nature's earthly majesty and the navigation of space. On Par Avion (78'45") Adrian adds a third dimension, questions about his place in both. As this CD is part four of the Sequencer Sketches series, the first five tracks are centered on the animated and dynamic skipping sequencer patterns Adrian has become so good at producing. Rhythms build, layer upon layer, as each piece plays out - endlessly melodic, dreamy and light. The musical progression repeats in dozens of variations to create an intoxicating architecture of sound. The remaining two tracks are a sobering 30 minutes worth of music made in a reflective mood. Patient listeners are richly rewarded as every tone is colored and inflected with the mythic qualities of a natural synthesist. This new territory is particularly searching. Onerous to describe, wondrous to hear, these slow movements are radiant and still with an inexpressible air of mystery. This music has been meticulously designed and executed in an attempt to illuminate the inner darkness. The expressive potential for this region seems limitless, but who will reach? In Rudy Adrian's world beauty is still relevant, and people still possess the ability to recognize it. 2007. Chuck van Zyl / Star's End Rudy Adrian created the first 50 minutes for this cd for the internet radio shows "Stars End" in the USA (hosted by Chuck van Zyl) and "Silent Running" in Luxembourg (hosted by Garston Klares). Musically, the cd is a successor to the critically acclaimed first three albums in the "Sequencer Sketches" series. The music by the New-Zealander is an excellent mix between sequences and ambient structures. Adrian is a master of the sequence. The special thing is, that he doesn't use a stack of (analog) synthesizers and sequencers to realise this, but he creates all the music with just one single synth, a Yamaha SY77. The wonders of flight form an essential part of the album, hence the title. Again, Rudy proves to be one of those rare musicians that really have to ability to make the mentioned mixture work. Just listen to the fantastic title track with which the album opens. The wonderful "Across The Universe" is a collaboration between Adrian and Alpha Wave Movement (Gregory Kyryluk), a musician that moves himself in a similar direction as Rudy. The last two tracks Starfields 2-Part 1" and "Starfields 2-Part 2" should be seen as a bonus album". They represent the long-promised atmospheric half of Starfields-Sequencer Sketches Vol. 3". Hopefully Rudy will continue with the Sequencer Sketches series for many years to come. 2007. Paul Rijkens This is a beautiful work within the frame of Space Music, Ambient and Contemporary Instrumental Music, full of poetry and beauty, very powerful in some moments, calm and simple in others, yet always full of shades that cannot leave anyone indifferent. The music is bright, full of energy, and leads the listener to a world of emotive sonic experiences. Edgar Kogler Rudy Adrian's a rare example of an antipodean keyboard artist - New Zealand based, he's given performances in the USA and Luxembourg from where much of the material for this particular album was taken. Despite the subtitle "Sequencer Sketches 4", the CD includes much ambient, abstract material as well as spoken voiceovers in French, and was created largely using an old Yamaha SY77 synth and equally ancient Apple computer with software dating from 1988. So although there are uptempo sequencer passages here, they alternate with light chords of choral and string sounds, chiming and other acoustic sounds, and deep abstract textures. Quite a varied album then, relaxing in many parts but with a good sense of dynamics, and featuring a nice studio picture of Rudy's keyboard setup. 2008. Mark Jenkins The first five tracks of Par Avion, nearly 50 minutes, are the sequencer sketches, starting with the dreamy title track. A brief French soliloquy courtesy of Rudy’s good friend Barbara Stone adds a unique twist to his familiar synthesizer sounds. Soft in pacing and mood, this makes a beautiful opener. Also mellow is "Bavarian Eagle", with a fascinating sequence that sounds like a child’s toy or music box being hand-cranked to create the lilting sound. As Adrian does so well, this one slowly builds, picking up the pace and deftly layering in synth solos and various electronic sounds and effects. It is very much the classic Rudy Adrian sound, almost too familiar perhaps but enjoyable just the same. There are some nice segues as it moves from one section to the next over its 14 ½ minute course, in particular a mesmerizing section around the 10:00 mark. "Across the Canyons" is a collaboration with Alpha Wave Movement that flows quite evenly along. Though definitely sequencer based, this fourth volume of sequencer sketches is more relaxed throughout. "Soaring Birds" even features a lovely piano intro. Only "Sore Birds" really picks up the pace at the end. The last two tracks, nearly 30 minutes, are intended as a bonus album, quite different from the rest, a very ambient affair. "Starfields 2 – Part 1" starts with dark metallic shimmering sounds. If one could imagine music to accompany free-floating in deep space, it would sound something like this. This is colder and harsher than Adrian’s mellower albums like MoonWater and The Healing Lake, pretty dark and dank stuff for him, but he pulls it off beautifully. Lie in the middle of a dark room with headphones on for this one. Two fantastic albeit different Rudy Adrian albums on one disc, what could be better? 2007. 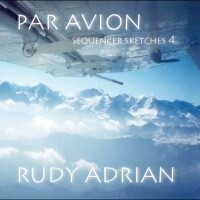 Phil Derby / Electroambient Space "Par Avion, Sequencer Sketches 4" es el nuevo trabajo del compositor australiano Rudy Adrian, un hombre que siempre me ha sorprendido con sus dos estilos musicales. Este australiano, siempre ha sabido conjugar a la perfección sus trabajos más atmosféricos y ambientales con sus discos más en el estilo de la Escuela Berlín. En esta ocasión, nos volvemos a encontrar con su estilo más secuencial, pero incluye una sorpresa, que es la colaboración en el tema "Across The Canyons" de Alpha Wave Movement. Rudy Adrian lo ha vuelto a hacer y nos sorprende con este trabajo lleno de secuencias que nos ayudan a emprender de nuevo el camino subidos en ese avión que todavía no sabemos a donde nos llevará, pero en el que seguro que disfrutaremos de buena música electrónica.